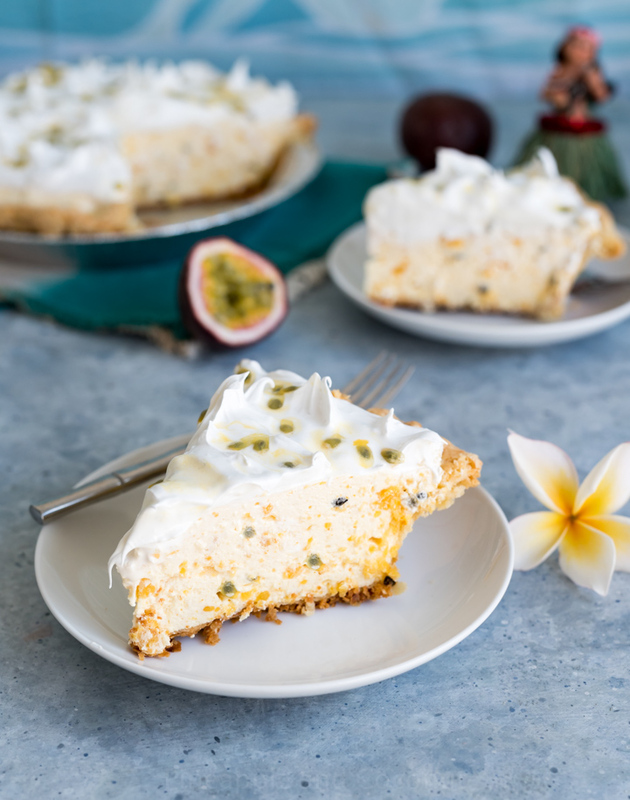 Hawaiian Passion Fruit Chiffon Pie is pie perfection as far as I am concerned. 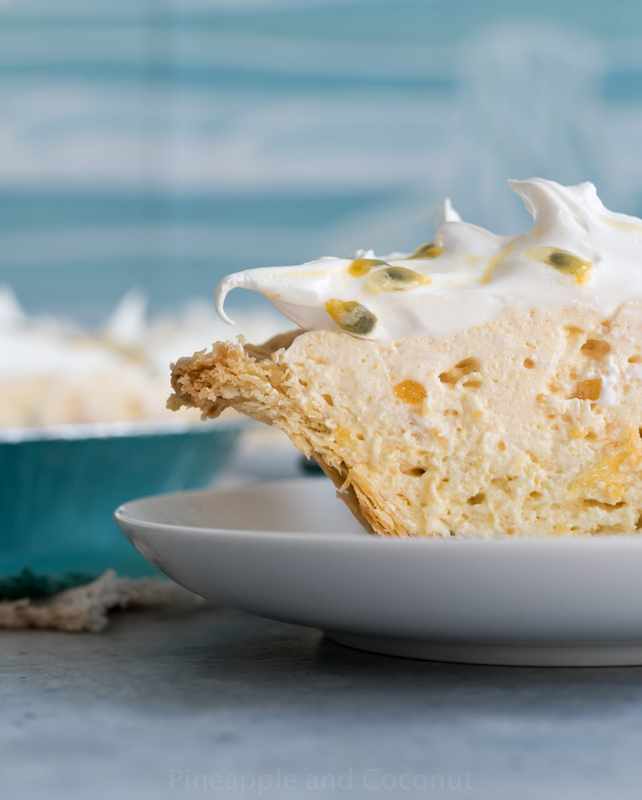 Light, flaky crust filled with an almost lighter than air tart passion fruit chiffon filling, and a sweet marshmallowy frosting and topped with fresh passion fruit seeds. 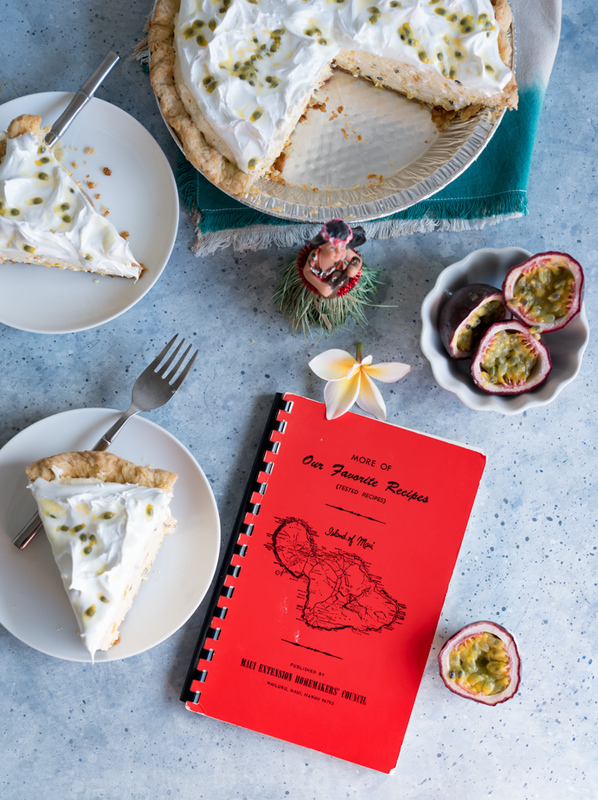 If Hawaii was a pie, this would be it. I counted and this passion fruit chiffon pie is the 5th pie I have ever made. Besides testing the recipe of course. But 5th flavor of pie. I made an apple pie once before starting a blog, a boozy pumpkin pie, a persimmon pear pie, a coconut cream pie and now this one. I have made a few galettes, or free form pies but I don’t count those since those are easier to make. For being someone who claims to not like pie, I am getting better at making them. And eating them. 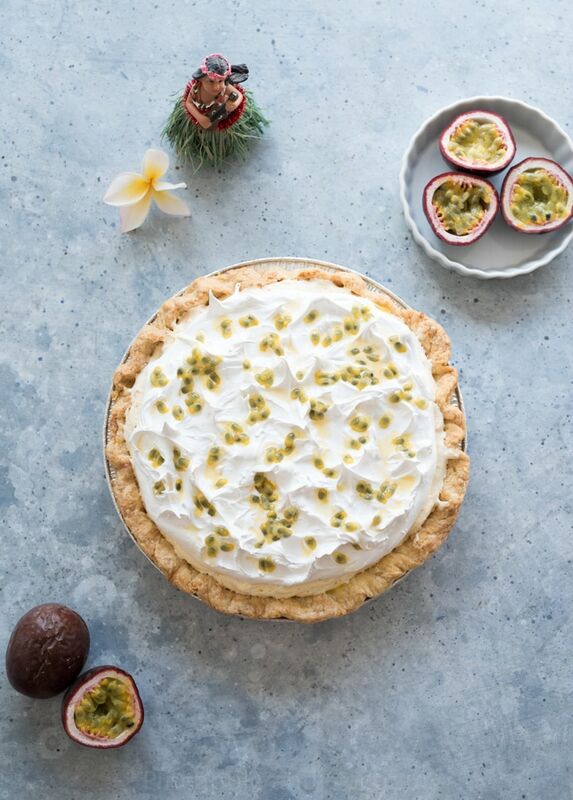 This passion fruit chiffon pie isn’t my original idea. It comes from Hamura Saimin in Lihue, Kauai, Hawaii. A little hole in the wall mom and pop Hawaiian Saimin restaurant. That is known for two things. Saimin and this pie. Hamura Saimin is a “No-frills, counter-serve space for saimin (a classic Hawaiian noodle soup) & lilikoi chiffon pie.” I LOVE Hawaiian saimin. So you go for the saimin, stay for the pie. At Hamura Saimin the menu is pretty simple, counter style community seating and everyone there is like family. And if you don’t know who you are sitting next to by the end of the meal everyone is calling each other “cousin” or “cuz”. Because that is the Aloha way. My brother and his family had traveled over to Kauai the month before my family and I did last summer. They were exploring Lihue and came across the restaurant and decided to stop in. My brother texted me ” currently eating saimin and passion fruit chiffon pie. You guys will love. You have to come here next month” So we added it to our ” Places to eat at on Kauai” list. I am so glad we stopped by. The saimin was amazing, the pie even more amazing. We got one slice to share and I wished we had gotten more. You can order a whole pie to go too. My sister in law did that on their vacation. 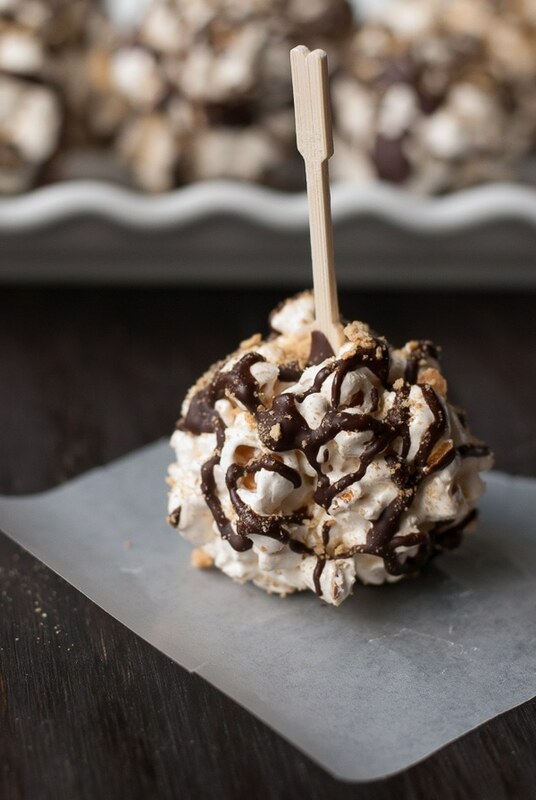 But then you would have to eat it all since the pie wouldn’t travel home well. Which probably isn’t a problem depending on how long your vacation is. We had many more places to eat on our list, so one slice of the amazing passion fruit chiffon pie it was. 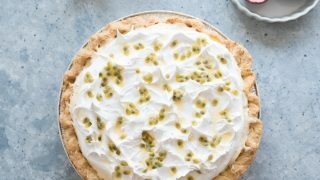 It was so light and airy, that sweet-tart tang of the passion fruit and lightly sweetened creamy topping that was hard to exactly figure out if it was whipped cream or a meringue. Maybe if I had gotten more than one slice I could have figured it out. The Hamura Saimin lilikoi chiffon pie had the lightest, flakiest crust I had ever seen. I am not the biggest fan of pie crust, but ever since making The Bravetart’s pie crust for my coconut pie I have become a fan and I knew it would work perfectly for this pie. The recipe makes two pie crusts and I had used one for my coconut pie and had frozen the other for a later date. For this pie. But I didn’t have the recipe for this pie. At least I didn’t know it at the time. 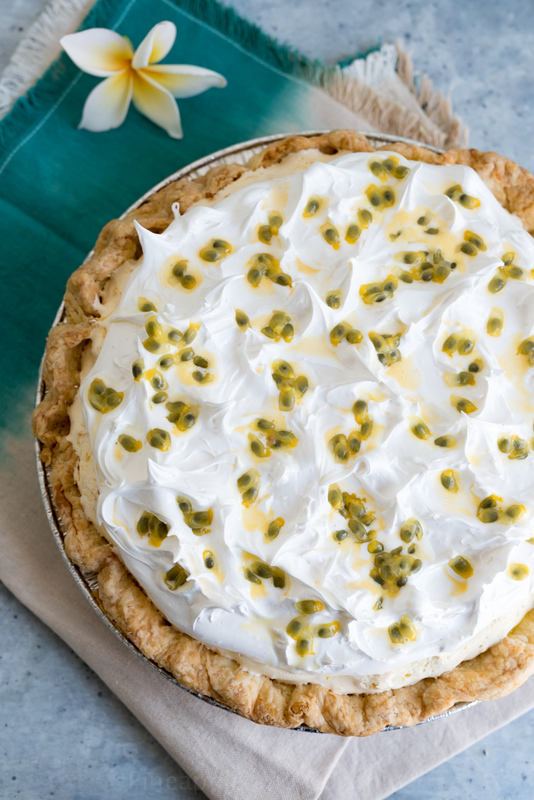 I am so glad I saved that second pie crust from the coconut cream pie because when I decided on Sunday to make this pie for today, PI day, aka 3-14. 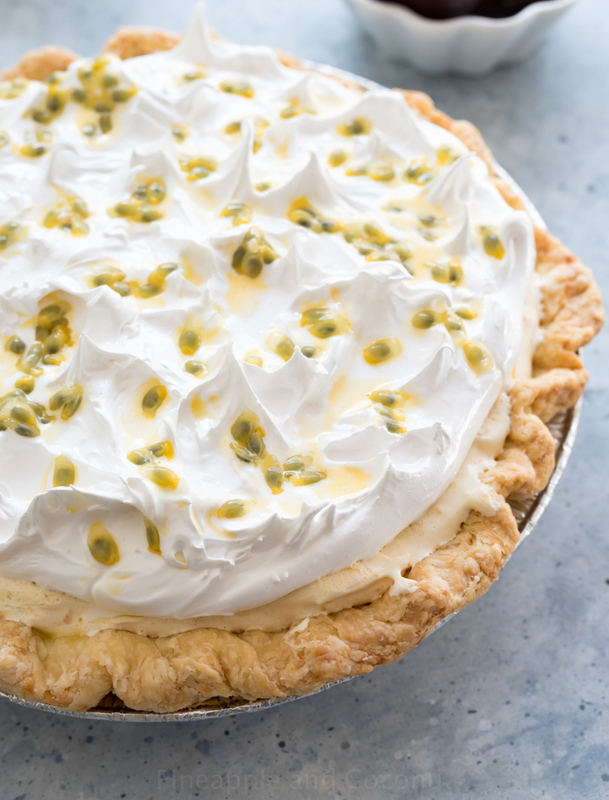 Foodies love a good pun, a play on words so why not make pie for pi day? Just LOOK at how flaky that pie crust is? Stella’s recipe is perfection and so easy to make. Even for a relative pie-crust newbie like myself. I think being in the freezer a couple months made it even flakier. I love vintage Hawaiian cookbooks. I always try to find some on my vacations to the islands. When we went to Maui in 2015 we had the most amazing banana, mango, guava and passion fruit breads from road-side stands on the way to Hana, from the Maui swap meet and farmers markets. I was on the hunt for those recipes to recreate at home. We went to the Talk Story bookstore in Hanapepe. 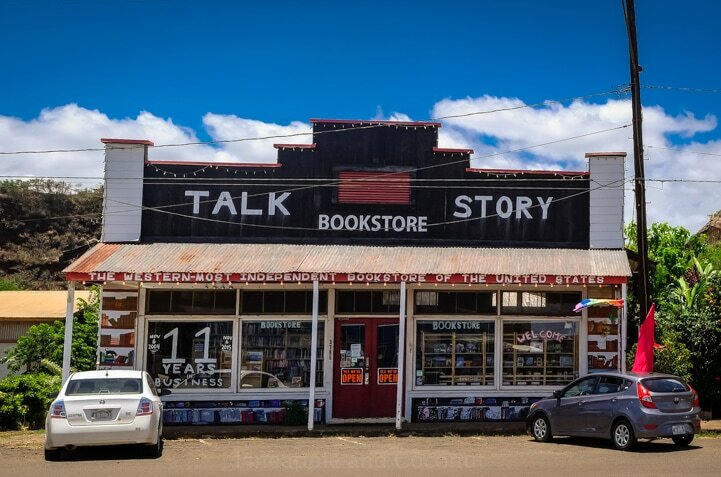 The westernmost book store in the united states. I headed straight for the cookbooks. I flipped through a few looking for the bread recipes, not even thinking about pie recipes. I bought a few that I found and packed them in my suitcase to bring home to add to my collection. 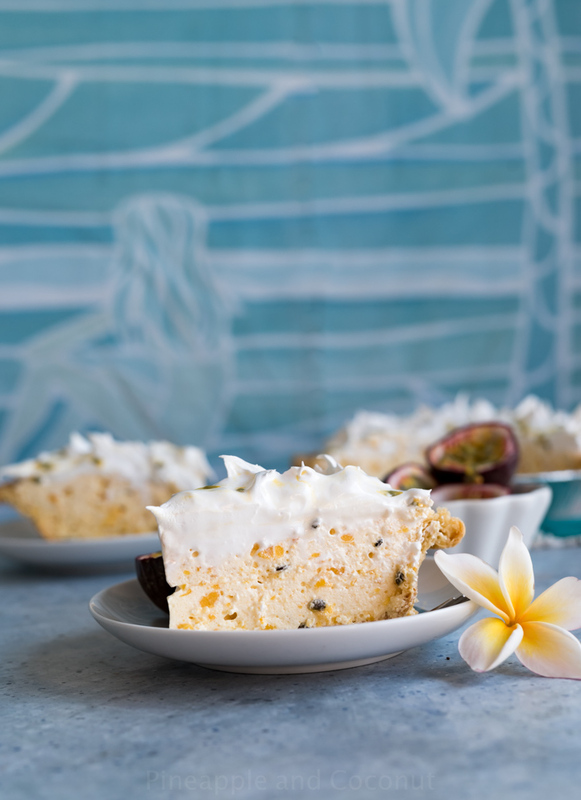 This one here, Our Favorite Recipes, from Maui has a ton of great recipes in it. Being a vintage printing some of the recipes are very vague. No mention of what size pan to bake in, suggesting moderate heat for the oven. No mention of baking times. I haven’t tried those recipes yet. 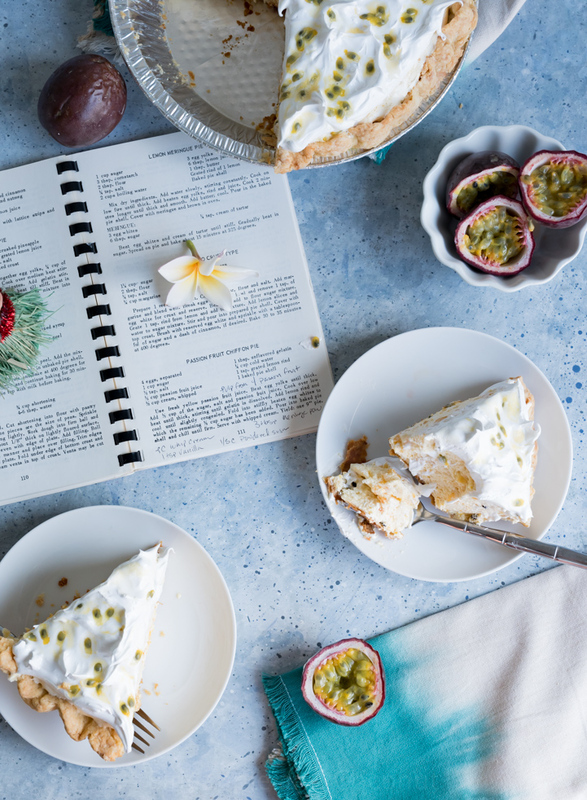 I hadn’t even notice the recipe for passion fruit chiffon pie when I was at the bookstore or when I was thumbing through the books looking for the mango bread recipe. When I decided to make this pie I had looked online for Hamura’s recipe and I wasn’t sure if the ones I found were the exact one or another person’s attempt at it. I looked through my books and there was a recipe for it. So I gave it a go. The recipe calls for passion fruit juice. The Hamura Saimin lilikoi pie is a pale buttery yellow and I had fresh yellow passion fruits. I also had passion fruit juice from Aunty Lilikoi that is more orange in color. I decided to adapt the recipe a little and use both the pulp with seeds and the juice. Passion fruit puree can also be used. For the topping I made a 7 minute frosting that is super easy to make and is a marshmallow-like meringue frosting. I was going to make whipped cream frosting but for some reason it kept flopping. I tried three different brands of cream and none were whipping. With the amount of time I was taking to whip them I should have made butter and instead I kept making soup. Oh well. 7 minute frosting it was and I am so glad I did. It balances out the tart passionfruit chiffon so well. 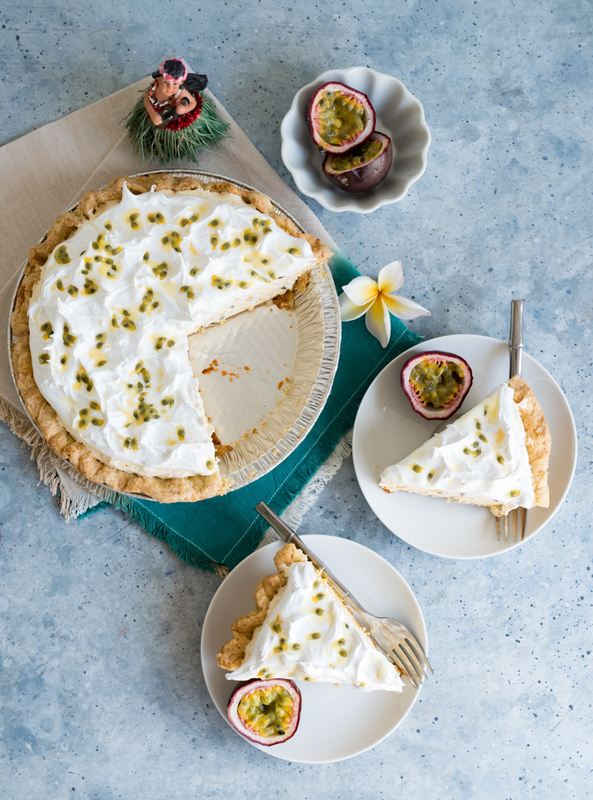 I love the look of the passion fruit seeds in the pie and I also drizzled one passion fruit’s worth of seeds and pulp over the top to give it more visual appeal. I love how this pie came out, both looks wise and taste. I might just become a pie master after all!! 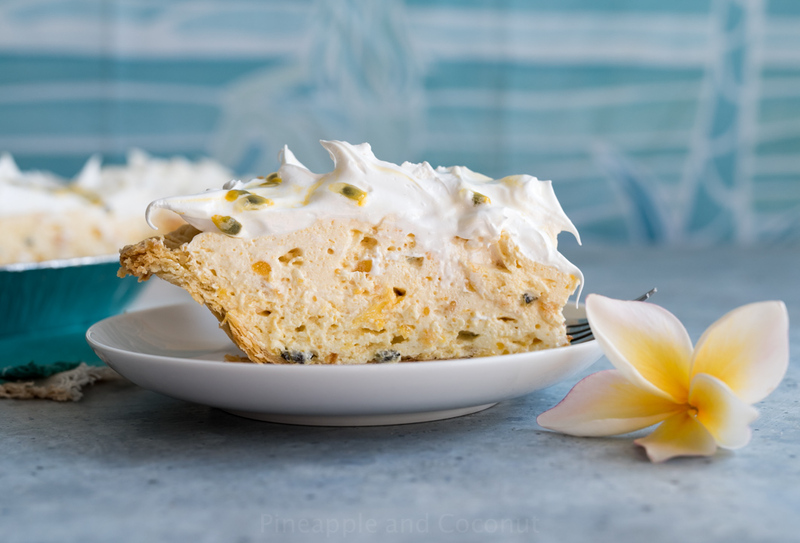 Hawaiian Passion Fruit Chiffon Pie (Hamura Saimin Lilikoi Chiffon Pie) www.pineappleandcoconut.com Makes one 9” round pie Time to make depends on if you use a pre-baked pie crust or make one the day of making the pie. The pie is best served the next day so chilling overnight will yield a longer prep time. Set a pan of water over medium high heat and bring to a steady simmer. Make sure the water level is low enough that a bowl set on top wont touch it. 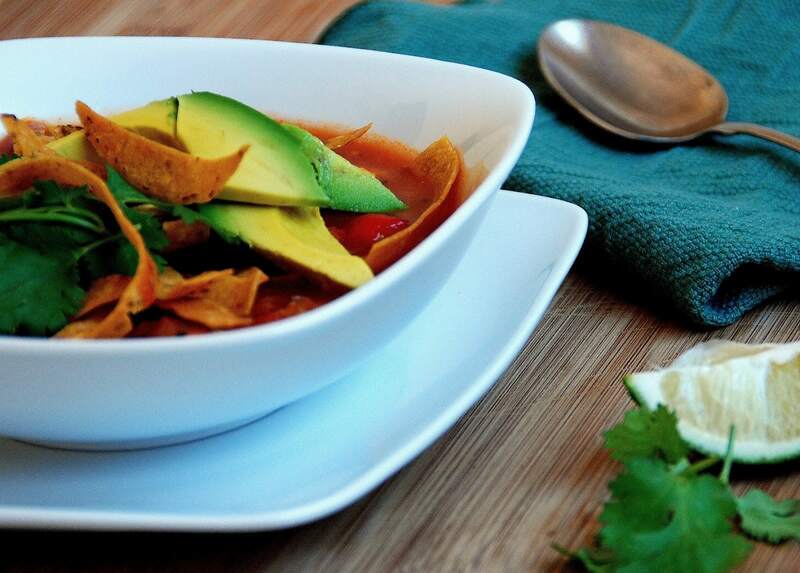 Lower the heat slightly and keep simmering. In a small bowl add the 4 tablespoons of cold water and sprinkle the gelatin over to soften. In a bowl that will fit over the pan of simmering water, whisk the egg yolks until thickened and lighter in color, add in passion fruit pulp and juice ( or puree), 1/2 C of sugar and salt. Set over the pan of simmering water and whisk until thickened. About 8-10 minutes. Being careful to stir constantly so the egg doesn’t scramble. Add in the softened gelatin and stir until melted. Remove from heat and cool until thickened and slightly congealed on top. Whip the egg whites until foamy, slowly add in the remaining sugar and then whip until stiff peaks are formed and the meringue is glossy. Fold into the passion fruit mixture and stir until fully combined. Fill the pie crust with the mixture and chill at least 4 hours up to overnight. Using the same double boiler method as the pie filling, set a pan of simmering water over the stove. In a bowl that fits the pan but won't be touching the water, whisk the frosting ingredients except for the vanilla for one minute using a hand mixer. Set the bowl over the simmering water and continue to mix on high for 7 minutes. Remove from heat and mix in the vanilla extract. Let cool slightly then spread on the top of the chilled pie. 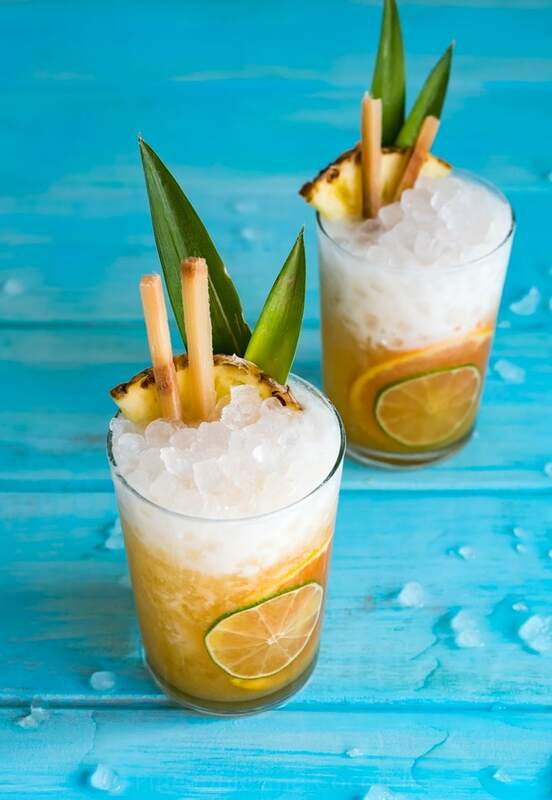 Garnish with passion fruit pulp over the top and serve. Passion Fruit can be found at specialty markets or in the tropical food sections of most well stocked grocery stores. Same with passion fruit juice and frozen puree. I use Aunty Lilikoi passion fruit juice. I order from them online. I prefer it since it is a thicker juice that is 100% passion fruit and not thinned out with water or other fruit juices and no added sweeteners. Its nice and tart. Aloha and happy PI day!! 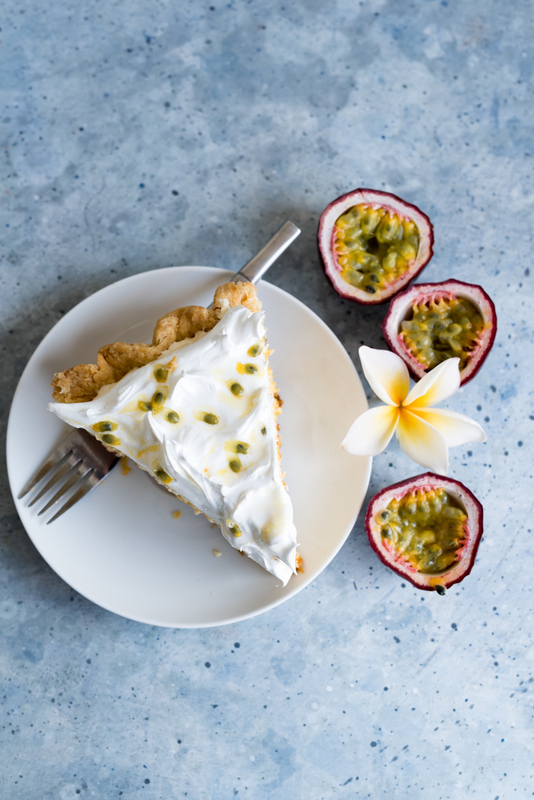 Hope you try my recipe for Hamura Saimin’s passion fruit chiffon pie. If you do let me know! I always love hearing when readers make my recipes. What a great recipe find! Thank you for sharing. Have you tried using the yellow lillikoi fruit instead? If so, did you find it to produce a different flavor? 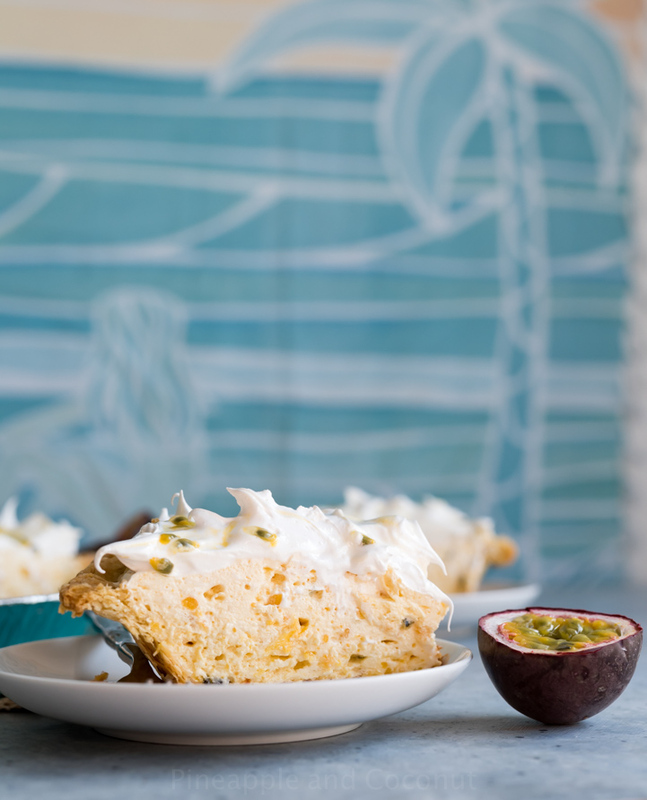 Or is the purple lilikoi fruit most recommended to use for this recipe? I don’t have access to fresh lilikoi fruit, just the puree. Can I just use the recipe with out it? Or should I use a substitute. Should list the sugar in the frosting as confectioner’s or powdered, if that is what it is supposed to be. You list granulated in the filling, but just say “sugar” in the frosting. There are many kinds of sugar, so narrowing it down would help for people like me who have never made it before. Granulated. Sorry about that! Thanks for catching it, I have updated the recipe. Hope you enjoy the pie!